If you still want to keep using this program after the 5 day trial period, please use the paypal button below. With in a few minutes to serveral hours of receiving payment I will send you a license file. To help speed up the registration process, please send me an email with your perosnal id code that can be found on the registration form. The Paint Estimator is software to help painting contractors manage all their estimates, create nice looking proposals and invoices all in one place. It was written by a real painter who has been painting over 25 years. It is designed for the contractor who is an owner / operator and has a few small crews. It's also aimed more on the residential side of things however you can still use it for commercial as well. It's not for everyone as none of these type of programs are. So please try it out first by downloading the trial version. The Trial version is the full version, it just expires after 5 days. 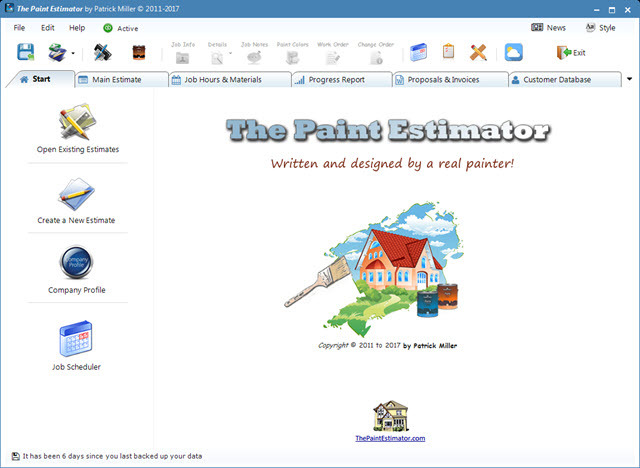 The Paint Estimator is for computers that are running the Windows Operating system. This will not work on Macs or Tablet pc's. However there are few tablets that do run the full version of windows like the surface pro. Please check the requirements prior to downloading in the support page. This program has been tested on Windows 7, Vista, and Windows 8. 8.1 and Windows 10. Both x86 and x64 versions. For users who have tried the program in the past and want another 5 days to try it out, just send me an email and I will send you a temporary license. No subscription fees, no upgrade fees. Just a one time fee that gets you the support and all future updates. Please feel free to contact me at ThePaintEstimator@gmail.com if you have any questions at all.